A few months back, I introduced you to a stabilization device called a quick chock or speed block. Basically, it is a platform with a large wedge on top to take up space quickly and maximize ground contact. Well, this month I'm going to show you two other ideas that work well for stabilization of upright vehicles. One of these looks like our traditional friend — the step chock — but a much improved variation. The other one is the adult-sized version of Lego blocks! First, let's focus on the "rapid stair" chock from ResQtec. This chock appears similar to a step chock, but has a unique process incorporated to provide quick stabilization — a two-piece plastic device composed of a large chock which, instead of stair steps, has an incline plane. This "traveling block" has a mirrored incline plane to the large chock, topped off with a large flat platform. Each of the incline planes have "teeth" that lock together when pressed. The rapid stair is placed much like a step chock, and the traveling block is placed near the base of the large stair. When the rapid stair is placed under the vehicle, the traveling block is slid upward on the large stair, and wedged between it and the underside of the vehicle. This step maximizes contact between the vehicle underbody and the ground. It all makes for both rapid set-up, stabilization and securing of the vehicle. Essentially, the more weight is placed onto the traveling block, the tighter the entire unit becomes. Another nice thing about these devices is the fact that they can slide flush against the side of the vehicle — so there's no trip hazard by sticking out. You place your foot against the stair and pull on the rope connecting the traveling block to slide upward and wedge itself between the vehicle and the stair itself. One of the great things about the rapid stair chock is once it is tight, it can become even tighter if more force is applied. The second item that is gaining popularity is the lock block of cribbing or, put simply, Lego blocks on steroids. They come in a variety of shapes and sizes and, just like Lego, they all lock together. Some even have special connector pieces to attach stacks of blocks together. These crib blocks are placed in the same locations as we place our step chocks, quick chocks or rapid stairs. We build up our "stack" close to the space under the vehicle and then slide it under the vehicle. We then place a wedge on top of the crib stack between it and the vehicle, and tap it into place to make the stack tight. So what is the advantage? 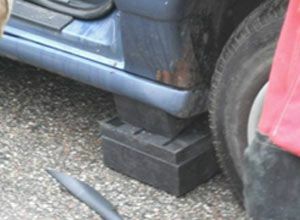 First, this type of cribbing is flush against the side of the vehicle, eliminating any potential trip hazard. Next, it has a larger footprint than a normal step chock in relation to what it comes into contact with on the vehicle. Think about it, rescuers: When we stabilize vehicles, we want to maximize ground contact with the vehicle and the ground itself, thus making it a rock solid platform for us to work from. Another good use of this type of cribbing is we can use it when we cross-ram inside the vehicle's interior; the crib block will spread the force of the ram out and prevent the ram end from punching through the vehicle itself. Both of these types of cribbing are made from recycled plastic. This allows them to be easily cleaned off after service. And the more they are used, the end that comes into contact with the ground gets worn and scuffed — and actually grips the roadway surfaces better. David Dalrymple is a career EMS provider for the RWJUH Emergency Medical Services in New Brunswick, N.J., and he is a volunteer FF/EMT/Rescue Technician for Clinton EMS/Rescue in Clinton, N.J. He has been actively involved with emergency services for 27 years. Dave is the education chair of the Transportation Emergency Rescue Committee - US (TERC), is certified as an international level extrication assessor and serves on the Expert Technical Advisory Board of the International Emergency Technical Rescue Institute as their road traffic accident advisor. He has taught and assessed in North America, Europe, the UK and South Africa. In 2007 he received the coveted Harvey Grant award for excellence in rescue education. Dave can be contacted via e-mail at David.Dalrymple@firerescue1.com.